Posted January 15, 2019 by Helena & filed under Art, Writer's Life. 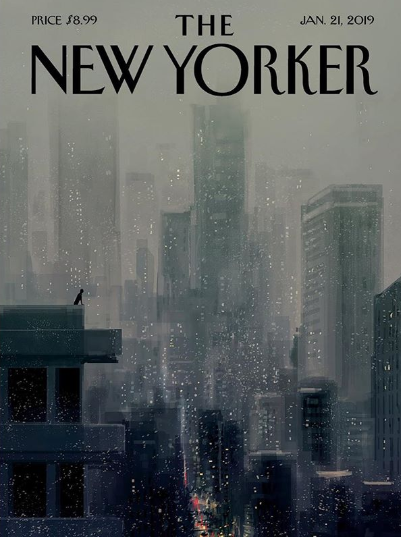 Pascal Campion is the mega talented artist who is illustrating my next picture book, The Paper Kingdom. 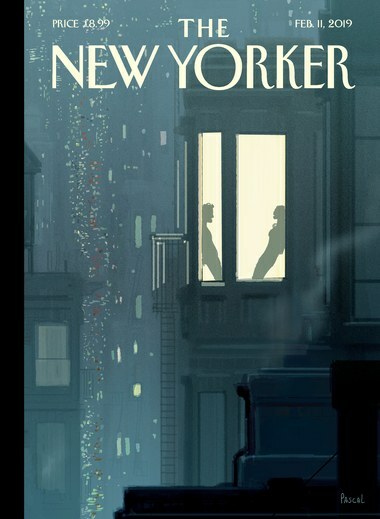 And…*drum roll*…his illustration is on the cover of The New Yorker!!! I love his nighttime scenes, and this one is so, so beautiful. Check out his interview here. What’s really amazing is that Pascal mentions Jean-Jacques Sempé as one of his inspirations. I’ve been a huge fan of Sempé since high school, when my French teacher introduced us to the Petit Nicolas series. I’ve been collecting his books, and here’s a prior blog post about him. I’ve even traveled to see his art shows. (Crazy fangirl alert!) So when Pascal mentioned his admiration for Sempé, I whispered to myself, “I knew it!! !” Pascal’s work reminds me so much of Sempé’s illustrations, which I LOVE. Pascal and I have been corresponding about the interior illustrations for The Paper Kingdom, and they are absolutely splendid. I can’t want to reveal more details! We’re meeting up soon to celebrate – should I break out some champagne from Veuve Clicquot or Taittinger or even…Dom Perignon?? An interesting thing about being a writer of picture books is that you normally don’t have much input on the art. The publisher hires the illustrator, and the in-house art director works with the illustrator to bring the artwork to life for the story. The writer normally doesn’t see the artwork until it’s final, because publishers like to have the artist interpret the story in their own way, without the pesky writer butting in. The experience with The Paper Kingdom has been highly collaborative. My editor at Penguin Random House sent me the initial sketches for my comments, and those suggestions were incorporated (one of my notes was that I wanted to see more of Pascal’s iconic nighttime cityscapes in the book, and now they will be in there – YESSS!). My editor and the art director recently held a conference call with me to get my input on the latest version of the interior illustrations, and my notes are now in the process of being woven in. It’s so amazing how respectful they are of my vision for the story. Pascal wrote me recently to make sure I was happy with his latest drawings, and I am! In fact, I’m overjoyed. Pascal’s artwork truly enhances the story, especially because the entire story takes place at night, and Pascal’s nighttime scenes are exceptional. Check out more of his splendid artwork here. I’ve been very fortunate because with The Turtle Ship, the art process was very collaborative as well, partially due to the fact that Colleen and I had already met each other online before the publisher announced that she’d been selected to illustrate the book. You can read more about that here (scroll down to the 7th question in the Q&A). It’s always so moving for me to see my characters come to life in full color. And just like with The Turtle Ship, I cried a little when I saw the illustrations for The Paper Kingdom. Such wonderful artists who use their talent, hard work and passion to contribute their unique vision to the story. I’m utterly grateful. The book is going to be beautiful. The release date for The Paper Kingdom will be in about a year. More updates to come! « 2019 is almost here!